Preheat oven to 375. Heat olive oil in a warm pan, add onions and salt and let sweat for a few minutes until tender. Add garlic stir, then add cinnamon, cumin and paprika and stir. Add ground beef to onion mixture, oregano, salt and if using red chili flakes. Cook the meat and then add the green olives and red bell peppers. Stir everything together, taste the mixture and make sure it doesn’t need extra seasoning. Take off heat and let cool down for a few minutes. While it cools, roll the thawed out puff pastry and cut out small circles, fill half the circle with beef mixture. Brush the beaten egg around half the border, then fold the pastry over meeting the edges and seal creating a half moon. Press down on the edges and make sure air is out of puff pastry. 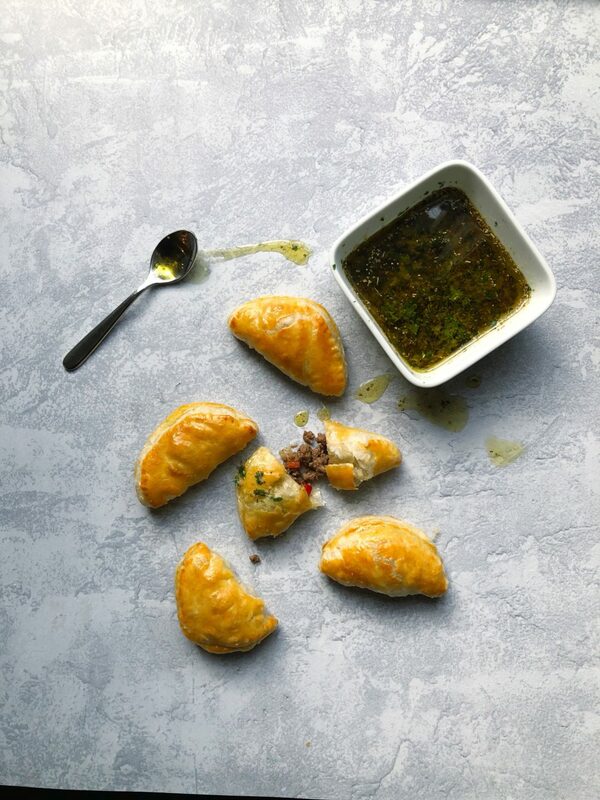 Using a pastry brush add egg wash to top of the pastry for golden brown empanadas. You can use your fork to press down on the edges to seal the sides together. 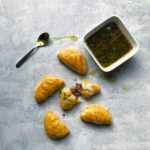 Make a small hole in empanadas for steam to come out so the filling doesn’t escape. Cook in preheated oven for 17-20 minutes or until golden brown. After you make the small circles of the puff pastry, if you have time put them in the fridge to get cold. It makes it easier to seal the edges together. You can create any filling inside, these are a simple starting point. I also love sweet potato and black beans for a vegetarian option.